One aspect of Bangkok that never ceases to fascinate and intrigue me is the kaleidoscope of contrasts ever-present throughout the city. Indeed, the Thai capital is hardly alone in this regard. Extensive travel throughout Southeast Asia has brought me in close touch with simple, humble Buddhism on the one hand and raw, furious capitalism on the other. I have seen elegant reverence for ancient traditions one minute and total, all-in embraces of Western excess the next. This is not to suggest that as a city, Bangkok has a patent on this kind of cultural dichotomy. Far from it. I can certainly name others that offer displays of venerable, quiet dignity by day and colourful flourishes of libertine, carnal gluttony by night. With Bangkok however, the flagrant contrasts are much, much more extreme. I think this is a key factor in the city’s vast allure. One enclave of Bangkok where a lot of this comes together is Silom. Part corporate and financial district, the area is also the most notorious nightlife hub in Asia and arguably, the world. Silom after all, is home to Patpong. The diminutive but infamous red light, entertainment and go-go bar district spans two parallel side streets between Surawong Road and Silom Road. Thought a fair number of locals frequent Patpong, the chaotic area is expat, backpacker and farang tourist central. Some come for the ridiculous spectacle that is Patpong, some for sheer curiosity’s sake and some for more nefarious reasons. The backdrop of Miss Saigon and The Deer Hunter is worth a look however, no matter how narrow. High above the seamy veneer of Patpong’s go-go bars is Silom’s extraordinary skyline. You want to talk about contrasts, just stroll down this de facto “Wall Street of Thailand” which runs into the adjacent riverside district of Bang Rak. Luxury hotels, Fortune 500s, banks, shiny malls and upmarket shops all crowd for space in this Bangkok economic nerve centre. Though cultural points of interest are few and far between in Silom, visitors can always explore the oasis-like environs of Lumphini Park. The heritage home of former Thai Prime Minister M.R. Kukrit is a welcome respite from the skyscraper-red light contrast as well. Last but not least, I always recommend visitors in Silom district catch a Muay Thai event at Lumphini Stadium and check out Assumption Cathedral. Nightlife, beyond the dense confines of Patpong, assumes other forms as well. Thanks to a plethora of phenomenal hotels in Silom district, the Bangkok ‘hood is chock full of superb bars, restaurants and even the occasional upscale rooftop lounge. If you want to get posh in the Thai capital, Silom is the place to do it. A number of reliable mid-range restaurants and bars in the district help keep the budget in line but many of Silom’s nobler digs are well worth a look-see. 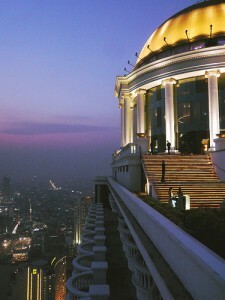 Splurge one night in Silom and slum it up the next – this is what makes Bangkok, Thailand so spectacular.